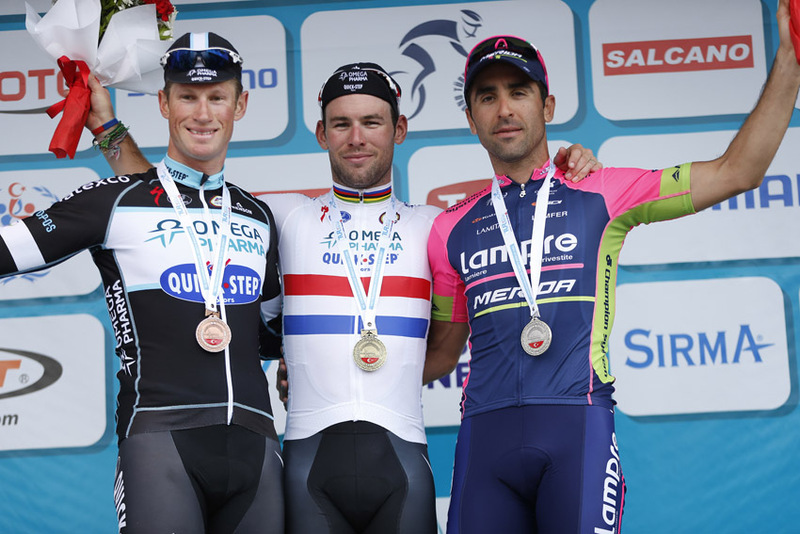 Mark Cavendish took his third stage win in the 2014 Tour of Turkey on Wednesday, tackling the day’s final climb with ease and then enjoying the perfect lead-out from his Omega Pharma-QuickStep team. Maximiliano Richeze (Lampre-Merida) came in for second, with Cavendish’s final lead-out man Mark Renshaw hanging on for third. The day’s five-man escape group was caught as the race neared the final 10km. David De La Fuente (Torku) promptly attacked over the top of the final testing climb of the day, hitting the descent at the front but was soon caught by the descending peloton. Theo Bos (Belkin) was one of those riders that found the final, unclassified climb, too much and dropped out of the back. Cavendish suffered no such problems, staying near the front of the bunch with a selection of his Omega Pharma-QuickStep team-mates for company. Omega Pharma-QuickStep then executed the perfect lead-out for Cavendish, with last man Renshaw dropping him off with only around 100 metres to go to take the victory with two bike lengths to spare. It was an clinical display of discipline and team-work. Earlier in the day, officials had taken the decision to neutralise the race on a slippery descent to protect the riders’ safety. Rein Taaramae (Cofidis) finished in the peloton to maintain his overall lead in the race, with Briton Adam Yates in second spot at 6 seconds. Thursday’s fifth stage from Marmaris to Turgutreis has a split nature, with a hilly first half followed by a relatively flat second half.